So here's my trouble. I wanted to tell you about Martha Stewart's Cupcakes (Clarkson Potter, 2009). To chat about my impressions, my likes, my dislikes, the nitty gritty details of this cookbook devoted to the small. But my attention has been captured by someone small, a small one who is getting bigger every day. Happy Birthday to you, our William - today is your first, and I can hardly find the words. All week I have been vacillating between my heart bursting with pride and my chest tightening with emotion. Such is the state of Mummyhood. 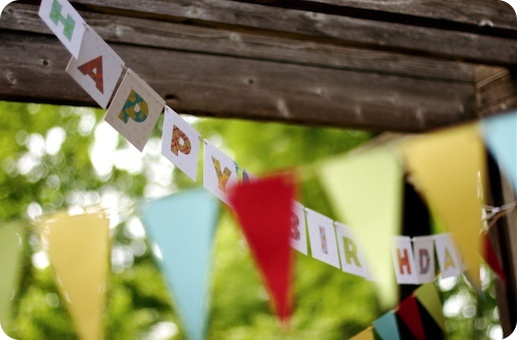 The First Birthday is an event met with a mile-wide grin and cheers of joy tempered with the sob-sniffle-wail of "my goodness, this is all too fast." And fast it has been. Our Littler Man is walking. William took his first tentative steps a few weeks back, and has now fully embraced the notion of upright locomotion. The rapid-fire thwack of his hands and knees on the floors of our home has been replaced with the padded rhythm of confident footsteps. And confident he is, as Will is not one to toddle. In a manner unsurprising to anyone who has met him, our William has the audacity to promenade. His walk is so spirited, his step so lively, there is most surely a song in his heart. Oh there now, I've digressed into ridiculous levels of Proud Parent Mode. My apologies. Where was I? Oh yes, cupcakes. With William's first 1st birthday party planning underway, Martha Stewart's Cupcakes was a wealth of imaginative cake ideas, all on a scale befitting the occasion. Silly me though, I put Benjamin in charge of selecting the flavour to try - and again as my children are nothing if not consistent, he chose the most basic of recipes, chocolate upon chocolate. But his choice was surprisingly astute, as our previous favourite chocolate cupcake was the One Bowl Chocolate Cupcakes from Martha Stewart's Baking Handbook (Clarkson Potter, 2005). Now One Bowl Chocolate Cupcakes are in the new book, but it is a different recipe. So it was settled, the dessert menu chosen for our celebration. The recipe itself warrants little description; it is a standard cocoa and buttermilk cake, with only a scant amount of oil. The method is as demanding as a boxed cake, with the dry ingredients whisked in a bowl, then the eggs, buttermilk and oil poured over. A few stirs, and it is done. This recipe yields cakes that look the example of cupcake perfection; each rose with the same rounded cheek, bulging slightly at their edges but with a gentle slope. 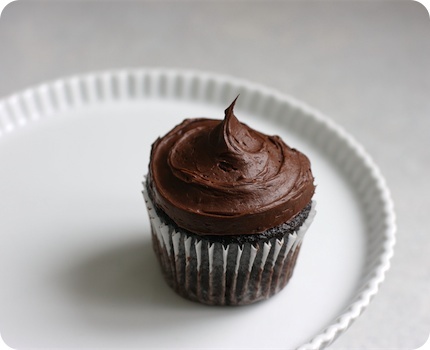 Best of all was their colour - a true, dark brown, exactly how a chocolate cupcake should look. As we did not have the recipes side-by-side for comparison, we had to rely on (unreliable) memory for our verdict. While everyone enjoyed the cupcakes, they were not met with the same knee-buckling adoration of the previous version. When I first made the Baking Handbook incarnation of One Bowl Chocolate Cupcakes, I recall thinking that these were simply the best cupcakes ever. This time, not so much. They were good, but not exceptional. It should be said though, that I am terribly finicky about my chocolate cakes so it takes a good deal to impress. While I shrugged at the taste, there was nary a complaint from our guests. Approximately 5 minutes after the Happy Birthdays and candles blown out, there were quite a few happy faces smeared with whipped ganache frosting. While my personal assessment of the cupcakes was lackluster, my overall impression of the book from which they came is not. I did not test many recipes from the book (honestly, even I can only eat so many cupcakes) as I would have liked, but I can tell you that the book Martha Stewart Cupcakes is full of fun. There is an obvious, infectious merriment in the way that the subject matter is treated, and the variations on the theme simply make me smile. One cannot help but be made a bit happier by pages upon pages of sprinkles and gumdrops, marizpan ladybugs, and coconut-feathered chicks. What's more, the cookbook is inspiring. Ingeniously, the book pushes the boundaries of cupcakery to include all manner of small cakes, and even cookies and meringues, as long as they are baked in that distinctive shape. There are filled cupcakes, layered mini-cakes, cookie-crusted cheesecakes, and simple pound cakes. Not all cakes are frosted, such as the Tiny Cherry and Almond and Pistachio-Raspberry teacakes, making these gems the ideal everyday treat to be tucked into lunchboxes or enjoyed as an afternoon snack. The combination of flavours, specific decorating techniques and helpful guides (including clip art templates) could all be adapted and developed to suit your specific tastes, and could be applied to the creation of full-sized cakes. One caveat, as with Martha Stewart's Cookies (Clarkson Potter, 2008), much of the content included in Martha Stewart's Cupcakes has been previously featured in the various publications of Martha Stewart Omnimedia. Personally, I enjoyed having the recipes available in a single source, but others may disagree and might have preferred a wholly originally collection. Time to get back to the business of being Mum to a 3-year-old and a 1-year-old. Oh my. So big. So fast. So wonderful. From the book Martha Stewart's Cupcakes. More photos from this series shot by my brother and sister-in-law can be seen here. 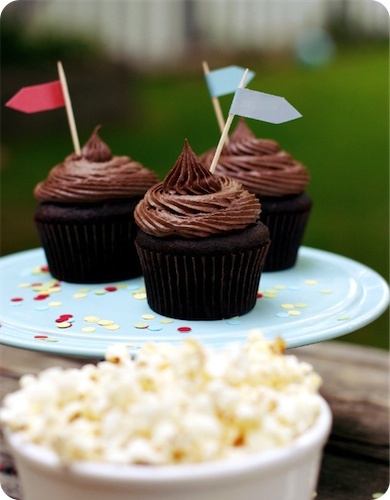 Now you didn't think that I'd forget to announce the winner of our Martha Stewart Cupcakes giveaway, did you? Without further wait, Mr. Random.Org took the honour of selecting ourwinners, as follows. I would like to thank everyone who entered, and highly recommend the checking out the fantastic conversation taking place in the comments section. To the winners, please e-mail me at tara [at] sevenspoons [dot] net, with your contact information at your earliest convenience. This photo was part of a series shot in January, the last time I baked cupcakes from Martha Stewart. I have three (main) places I keep cookbooks. There are those stored in the bookshelves that line our den (also where I keep my magazine back issues). I consider these the reference books, those that I turn to for a specific inspiration or if I am looking for a particular recipe. The top shelves are reserved for my most treasured-tomes, the coffee table styled works from authors I admire; they sit alongside the dog-eared, aged copies of cookbooks from my childhood and before. The second is our dining room table, much to the chagrin of my dear husband. Our dining room is often the resting place of books in transit, those making their way from the kitchen back up to the den. I would be lying if I told you that books do not sometimes take up an extended residence on that table, or if I denied my errant desire to line that room with bookshelves as well. The third cookbook habitat is our kitchen itself. Behind the closed doors of a built-in cabinet live those books I use most often. These are the books I feel lost without, the ones that best reflect the way I cook and the way we eat. The selection rotates now and again, with titles being promoted and demoted, but there are certain regulars that never lose their place. I am not yet sure as to where Martha Stewart's Cupcakes will land up, but I'm aiming to find out. With William's first birthday next week (so big!) and celebrations planned, I will be turning to Ms. Stewart for cupcakery inspiration. To enter, simply comment at the end of this post; maybe we can chat about our favourite cookbooks or cupcakes or cupcake memory - you decide. But leave your comment by midnight Wednesday, June 10, 2009 (EST), and please include both your email address if not signed in, and a note of your desire to enter (this way, non entrants can still join the chat). If you do not want to sign in, nor do you want to publish your email, please comment then email me at tara [at] sevenspoons [dot] net, with the name you used to comment. The winner will be selected by at random, and announced the next day. One note, due to distribution regulations, this contest is only open to residents of Canada. My apologies to international readers (this might be a good time to ask your Canadian friends to do you a favour). Psst. It got mentioned in the comments, so I'll add a note - here's my review o fMartha Stewart's Cookies from way back. January 16th marked Benjamin's third birthday, a perfect excuse for round two of the chocolate cake battle raging in my recipe file. Our biggest little man had requested "chocolate with chocolate" to celebrate his day, and what sort of Mummy would I be if I refused? I forget how it was exactly, but I stumbled upon the recipe for Double Chocolate Layer cake, from Chef Ed Kasky (as published in Gourmet magazine, March 1999). I must have been living under a rock this last decade, because this cake has quite a following, with over 1200 (hyperbole-laden) comments on Epicurious. It has also appeared on countless other sites and discussed in detail. With all of that fanfare, there was no alternative than to try this cake for myself. It might be a bit of retread of covered territory, but I have never been one to deny my curiosity. I had to know what the fuss was about. With multiple celebrations ahead of us, I followed my same procedure as before, this time with Martha Stewart's One Bowl Cupcakes, as published in her Baking Handbook (Clarkson Potter, 2005), against the lauded Double Layer Chocolate cake. The major difference between the two recipes is that the former is an all-cocoa preparation, whereas the latter includes both cocoa and melted chocolate. It should be noted, as reported in my earlier test, that I substitute some prepared coffee for the water called for in the Stewart cake. The batters were equally-easy to come prepre, with the Gourmet recipe notably thinner in its consistency. The Stewart batter was more viscous, and was my preference when I surreptitiously licked some from the bowl while cleaning up. 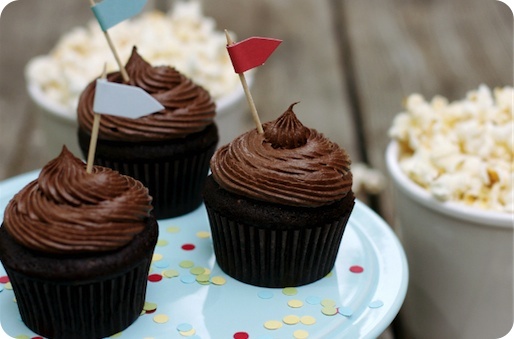 Half of each batter went into cupcakes, with their liners marked to indicate the recipe used. The remaining batter was combined, weighed, divided and baked into layers for a single, staggeringly-tall four-layer cake. It was one of the tallest cakes I have ever made, taller than it was wide, and inspiring an awed reaction from our birthday boy. Despite the impressive stature of the cake, the cupcakes were of my real interest. Using the same (by weight) of batter for each cup, the Martha Stewart cupcakes baked up ever-so-slightly taller, with a gentle dome and a bit of a rimmed edge. They were pretty, perfectly-formed and slightly cracked on top, an example of what a cupcake should look like. The Gourmet recipe baked up slightly flatter, but beyond that, the texture, colour and overall look of the cupcakes were identical. So it was down to taste. We tasted the two blindly, cake alone and then with frosting, and it was a unanimous decision. The Gourmet recipe for Double Chocolate Layer Cake won. Here's the thing. This cake deserves fanfare. The most fantastic, festive, fanciful fanfare that you can imagine - and more. Deeply flavoured, with a dark and even crumb, the cake is moist and tender but just a bit toothsome. Truthfully, it is similar to the Martha Stewart recipe, boasting just about every quality that had made me declare it the winner over Beatty's Chocolate Cake from Ina Garten last summer. Where the Gourmet cake took an edge was in its subtle fudginess, a bit of (excuse the technical term) squidgy-ness, that made each bite that much more satisfying. Now I will admit I am tempted to try the One Bowl Chocolate Cupcakes with a bit of melted chocolate stirred in, just to see how it would turn out. But for now, I am more than satisfied to say that the Double Layer Chocolate Cake from Gourmet warrants its fame. From Chef Ed Kasky, as published in Gourmet Magazine, March 1999. The recipe can be found online here. • Some comments on the Epicurious site report that they have had trouble with the Double-Chocolate Layer Cake overflowing their standard 10" pans. The recipe specifically requires 2" deep pans, which may remedy this problem. I can only comment on the taste of the cake, as I baked mine in four 8" round cake pans, with the remainder used for cupcakes, as pictured. From Martha Stewart's Baking Handbook. The Martha Stewart Recipe from the Baking Handbook is not the same as the One Bowl Cupcakes recipe that has been published on her site online, nor is it the one that was published in Martha Stewart Living for February 2009. The recipe is subject to copyright; however, a quick search does find it published online (you are looking for the recipe that begins with flour as the first ingredient).